OOC: I believe that they have only found the horse's head, movingthestars. Marie shuddered when they revealed the bloody horse head. She had always considered horses to be majestic creatures, and was dismayed at the idea of someone harming one. Marie shook herself off, chasing the disturbing mental image away. She tentatively took a step towards Belle and narrowed her eyes. There was no way that someone could simply sleep through that kind of trauma. Marie hissed under her breath, convinced that Belle had more to do with the horse's fate than she was admitting. *As Ursula watches as Angus' head is revealed on the pillow, she sighs as she conjurs her DFI kit and retrieves gloves and a camera. "So it looks like someone's seen too much of the Godfather, eh Belle. Someone hasn't given you an offer you can't refuse, right? He he he... Say Yensid, Wouldn't there also be survellience footage leading to this room..."
Mater pays attention as Yensid tells all of the detectives that the horse head actually belongs to Merida's horse, not Mulan's. Mater begins to roam around the room searching for something, anything that could be of help, when he sees that the bathroom door is closed. Mater: "Well, as long as this bathroom is nothing like that bathroom in Japan, Ill be alright!" He opens the door and with a slight flick of his tow line he turns on the lights. He notices some blood splatters on the floor and says: (to himself) "Hey, how did that get there?" Mater: "Hot dang!!! I found something! Everybody, I found something!" He reverses back into the room and despite Belle talking about something Mater interrupts: "I'm sorry Mrs. The Beast, but Mr. Yensid, I found something. Come look." OOC: It's just Angus' head that has been found; as Ursula pointed out, the murder was inspired by the Godfather. Vidia took note of the message, and listened to Yensid's next instructions. She volunteered to take the note over to the DSI lab for analysis. She flew as fast as she could, dropped it off, then flew back. She arrived in the lounge for tea, and patiently waited for everyone else. Si and Am, finding nothing on the balcony, strolled back into the room just in time to hear what was on the note. Heads high, they strolled out of the room, they had some unfinished cream to take care of. Arriving back at the lounge, they noticed their saucer had been cleaned up. Outraged, they jumped on the table. "Cream?" asked Si, knocking the cream pot over. "Half and half" responded Am, knocking that pot over. They left the 2% milk pot alone, after all they had standards. Merryweather walked toward the doors which opened onto the balcony, she hoped the concierge assigned Belle's new room with a view of France and overseeing the rose courtyard to give her some comfort. On looking at the note Belle surely would have preferred waking up to some salt water taffy. Noticing the small girl's hair it looked as though Vanellope had slept on her own helping of complimentary sweets. Heading out of the room she looked back at the remains of the once magnificent Clydesdale "Oh it's just awful!" Suddenly looking up spotting the raven "YOU! What are you doing here?!" before she can get another word in she is bustled out into the hallway and is prevented from going back in. She then makes her way back to the lounge. She felt a little calmer on seeing the lounge decorated in her favourite colour. Merryweather sat near Vidia and offered her the choice to pick whatever tea/food she wanted, as she would shrink it to size if Vidia wished. OOC: Is Yen Sid wearing his hat? Vidia, not quick to make friends, raised an eyebrow at her fellow fairy, but took her up on her offer of tea. "I'll just take a Chai tea." she said. And Vidia sipped her tea quietly, not sure whom to trust. OOC: I was wondering about the hat, too. Are they looking for Mickey or Yensid??? Marie curiously watched as Ursula worked. She then turned and left the room behind Vidia. She didn't want to stay in the room longer than necessary. Making her way down to the lobby, Marie hopped up onto a lounge chair and curled her tail over her front paws. Diablo perches atop Mater's crane hook to read the message on the mirror over his... shoulder? Windshield? As Yensid is bustling the detectives out of the room, the blue fairy notices him and yells at him. Diablo sighs and rolls his eyes. He wonders whether all fairies are so high strung. Mistress sure was! He follows the group to the lounge for tea, hoping they have some of those little round cakes. Oh! There's an idea! He hops across the table to the plate of little cakes, and rolls a couple of them over to the fairies with his beak, clicking politely. Mater felt extreme pride that he was able to help the investigation in some way. He hears that Belle will be given a new room and he thinks: "Well that's good. This one is dirtier than Professor Z." He leaves the room and heads over to the lounge to meet with the others. Indy is glad that Belle is going to get a new room as they were done the investigation. After the note was sent off, Indy went down to lounge to join the others and waited for Yensid. Vanellope continued looking for clues, when the detective known as Mater said he had found something in the bathroom. She jumps up on Mater's head to get a better look at the message. She began to get queasy again. Who was doing all of this? She hoped they would catch him or her soon. Yensid tells everyone to meet up in the lounge, so Vanellope makes her way there. She has never had tea before. Maybe it would be better than coffee. Marie watches as more detectives arrive at the lounge. She had tried to drink a bit of the tea, but it had tasted weird and left a funny taste in her mouth. She pushed her tongue through her teeth a few times, suddenly remembering the aftertaste. Marie's thoughts wandered back to Belle and the poor horse. Who could be so mean? Abu finally makes it to the Boardwalk lobby as he struggles to wake up. Just as he about to go ask where the others might be he sees several of them heading towards a lounge and talking animatedly amongst themselves. Tagging along, Abu hopes it's time for breakfast as he didn't get much for dinner the night before. 1. It's truly fine that Vidia volunteered to bring the note to DSI for analysis. When I ask for a volunteer in the game, anyone's character can do whatever is being asked. Information that's meant for a specific detective to 'find' and reveal or 'do' will be sent to that player via private message. 2. The Hat truly is missing. Yensid is not wearing it. Both the Hat and Mickey went missing during a performance of Fantasmic in the first game. As I have said, this game is a direct continuation of where that one left off. 3. Just a reminder that all posts must be a minimum of three lines to count towards your post count (it's in the rules). I've counted all posts up to this point, but I may not be so lenient in the future. "This is my CLUEINATOR...I just need to push this button while at a crime scene and it will automatically locate any clues. I had the idea from when I was a mereboy......You see I used to be interested in Sherlock Holmes and would read for hours about crimes and solving them. I wanted so badly to grow up and solve mysteries. Well one day in the local mall I saw a crime solving kit and decided to save and buy it. I didn't each lunch for a month saving every nickel my mom had given me for lunch. I was never that hungry though as a nickel would only buy a piece of moldy bread anyway. Well after missing exactly 36 lunhes I had enough to buy the kit. afterschool I ran to the store and I was so surprised to see my mom in the store and I hid so she couldn't see me. I was so surpised and excited to see her buy the very last detective kit. I was more excited because it was my birthday. I ran all the way home with expectations and dreams of solving crimes. when I ran into the house she gave me a package. I quickly opened it and was devasted that it was a bag of potatos. She gave my brother ROGER the detctive kit a week later for his birthday...."
Vanellope is drinking the tea, which is a little better than the coffee, but not by much, when she hears a voice come from the desk in the corner. She turns to face the desk and sees a pair of eyes appear. The eyes are followed by a large grin and a see through cat, who quickly becomes solid. He is also sipping some tea. The cat looks at all the detectives and begins to grin wider. This Yensid sure had some weird friends. Then again, so did she. *Scar arrived in the lounge right behind the wierd man in the labcoat. He sees that he has brought in another of his contraptions. Remembering the hiccup incident, Scar wants to avoid the machine if he can. As he is making his way to a seat the Dr is going on and on about life as a boy. while the others have been distracted by the appearance of the Cheshire cat. Scar remembers giving his badge to that cat once upon a time and makes a note to have a chat with him at a later time about that. Walking past the crazy machine that has been brought into the room, Scar sees a digital screen flashing CLUEINATOR and a keyboard below. He quietly makes his way to the keyboard and while the others have their attention elsewhere he clicks on the screen hits back space erasing CLUEINATOR and types in the word BLUEINATOR in it's place. Marie crinkled her nose at the appearance of the Cheshire cat. He was certainly a very unique character. She didn't like the way that he always spoke in riddles. She could never quite grasp the meaning of them, and they always ended up frustrating her. Marie watched as the dark lion clicked away on a computer. She cocked her head curiously, wondering what he was doing. OOC:: I may never forgive you for killing Angus. lol Aaaaand Dug has absolutly nothing productive to add at the moment, so heres some comic relief. 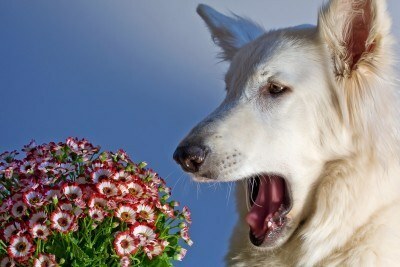 Which sends him into a sneezing fit. 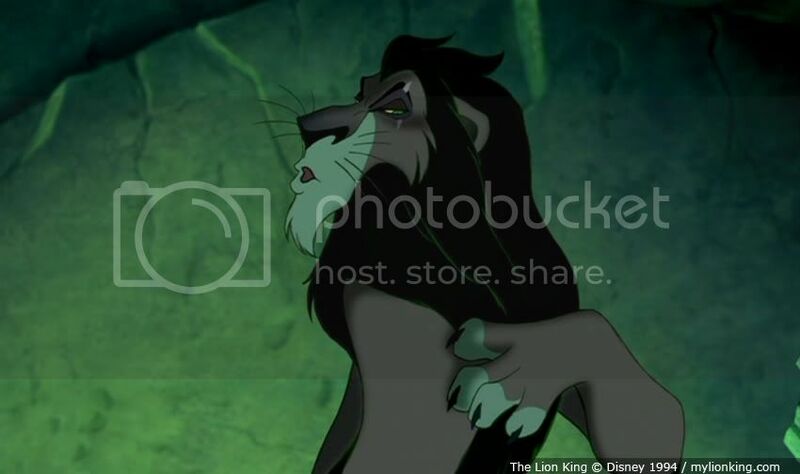 "Hello JR...I am Scar...I've been around quite awhile and you should know that this lovely lady is with me. I have also heard you have a fear of snakes...I have friends of the reptilian species. I could make a call and my good friend KAA owes me a favor." "Atleast this delay has kept us out of that dreadful EPCOT place thus far." Belle walked out of her new room in her green dress wearily. After taking a long shower and releasing all the tears she could from the traumatic morning, she was finally ready to join the other detectives. "What a way to come back to the investigation," Belle muttered. When she had received Yen Sid's letter, she was more than ready to pack her bags and return to Walt Disney World to aid the other detectives in the continuing investigation. She had texted Edna before arriving and while she was slightly disappointed to hear she and Hook wouldn't be joining this time, she was all smiles at hearing the two were visiting Paris together. She was further put at ease when she joined the team for dinner and saw many familiar faces and new trustworthy ones as well. She spent so long reacquainting herself with her old comrades and introducing herself to new ones that when she returned to her room last night she was completely exhausted and fell into a deep sleep. Belle shuddered, immediately putting the sight out of her mind. She felt sick not only at the finding of poor Angus, but when she thought of Yen Sid’s wary questioning of her, and the suspicious eyes of all the detectives on her as she told her tale. The new detectives were the most suspicious, and really Belle couldn't blame them. Talk about first impressions! Belle arrived at the lounge and quickly helped herself to a cup of earl grey tea. She looked around for a seat awkwardly as watchful wary glances came her away from every direction. She saw Dr Doofenshmirtz babbling on about one of his contraptions and quickly slid into the seat next to him, figuring he wouldn’t mind or notice. It was at that moment, her attention was caught by the familiar enigmatic feline.